The heat is on in Baltimore. In Season Three of the gritty HBO drama series, the war on crime is being lost… at a highly inconvenient time. It’s an election year, and a desperate mayor calls for an end to the drug wars and the rising body count. THE REVIEW: As the seasons have progressed in The Wire, the characters and their stories continue to build up while new pieces keep getting added to the puzzle. We started in season one focusing on Avon Barksdale (Wood Harris), his crew, and the drug trade in Baltimore. Season two added Frank Sobotka (Chris Bauer), his longshoremen, and a whole mess of smuggling, political corruption, and beyond. Season three is sort of a like a return to basics. Our main focus returns to Barksdale — just released on parole only a couple years into his seven-year sentence — and his right-hand man, Stringer Bell (Idris Elba). They appeared in season two, but season three puts them back in the spotlight and makes for the most exhilarating and intense season yet. On the cover — and by that I mean the first episode “Time After Time” — this season gets off to a slow start. The towers where Barksdale’s crew had a stronghold have been demolished and the major case unit — headed by Detectives McNulty (Dominic West), Greggs (Sonja Sohn), et al.— are tasked with investigating what appears to be small fry when compared with Barksdale, Bell, and even Proposition Joe (Robert F. Chew). As it turns out, these small fry are actually major players as we discover later on in the season. Combined with a slow start, this season also seems to be more fragmented than the past two. Part of that is probably due to the fact that it takes a while to see where things are going. Just because season three has a slow start doesn’t mean it has a strong finish (spoiler: it does). But it can make the pieces seem more disjointed than they actually are because you don’t know how they’ll be put together yet. Another reason is due to new characters like Cutty (Chad Coleman) and Marlo (Jamie Hector). Cutty in particular seems a bit out of place in the beginning when he’s fresh out of prison and returns to the street with the goal of going clean. It’s not a straight path though and he falters at times, but he ends up being a boxing coach to local youths. It’s a great example of the path this season takes. A lot of new characters and storylines are introduced at the beginning. Some familiar faces as I’ve mentioned, but in large part there’s a whole new batch with a whole new focus. For the first several episodes you’re just pulled along waiting to see where you’re being taken instead of eagerly running alongside the new developments. There comes a tipping point however where the season clicks and you’re waiting with bated breath to see what happens next. While you’ll have to hang in until episodes five or six (“Straight and True” and “Homecoming”) to see a payoff — much longer than season one where I got hooked by episode three — the payoff in this season is bigger. Not only is the payoff bigger, but the minor problems I had with previous seasons are almost non-existant. Minor characters like Marla Daniels (Maria Broom), Lt. Daniels’ wife, are better incorporated this season. While still seen only rarely, their involvement now matches the attention they receive in the show. This disconnect served as one of my only complaints in prior seasons and has now been mediated. And the solution wasn’t the greater screen time that I proposed, but rather less screen time and a targeted focus. Instead of trying to build the characters as a part of the environment (i.e. what is McNulty’s or Daniels’ home life like), they serve more as small asides that tell complete stories by themselves, albeit very small stories. In addition, there were the additions of Major Colvin (Robert Wisdom), his experiment with the legalized drug zone “Hamsterdam”, and the Comstat meetings. The Comstat meetings on the outside might appear to be the boring parts of this season — it’s a bunch of officers sitting around discussing the business/statistical parts of the job — but for me it was one of the most entertaining parts. Don’t think of it like the trade negotiations from Star Wars: Episode I which was as boring as it sounds. Rather, think of it just like any other scene with Deputy Commissioner William Rawls (John Doman) and Commissioner Ervin Burrell (Frankie Faison): full of wit, heavy sarcasm, and ruthlessness that destroys many of the weaker officers. THE TAKEAWAY: Season three is probably the slowest season yet in terms of getting to the heart of the main investigation and conflict, but the payoff is well worth it. Lots of familiar faces and plenty of new ones, with continuations of old stories (Barksdale’s drug operation) and the beginnings of fresh stories (the impending Mayoral race and political corruption). 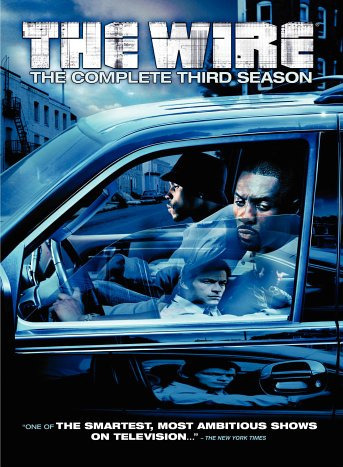 The Wire continues to deliver high levels of suspense and mystery revolving around the active investigations that get your adrenaline pumping and brain working in overdrive to keep track of the smallest of details. And as with seasons past, the finale is really on point. It wraps everything up nicely and sets up the next season in a way that answers questions but still leaves a lot open to the imagination. If the season finales are this good, I can’t wait to see what’s in store for the series finale.